No change in the control code is necessary to switch from HIL-simulated converter to a real-world physical converter, as the cables can be just swapped from one system to another. This interface interconnects the BoomBox to a HIL simulator. This way, any control implementation can be first tested – without any risk – on a simulated converter before it is later tested on real hardware. In this second step, all cables can be instantly swapped from the interface to the real converter. This interface allows to control imperix power modules from a HIL simulator. 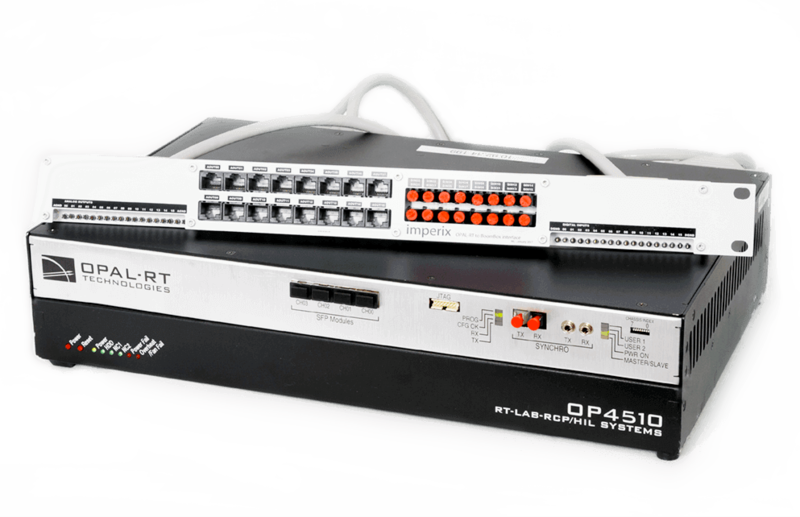 It provides the necessary signal connections to easily wire the digital outputs of the OPAL-RT hardware to the command inputs of the power modules, and retrieve any useful measurement to its analog inputs. This interface interconnects the BoomBox to an Opal-RT simulator. This interface interconnects the BoomBox to a RT Box simulator. This interface interconnects the BoomBox to a Typhoon simulator. This interface allows to control imperix power modules from an Opal-RT simulator. This interface allows to control imperix power modules from a RT Box simulator. This interface allows to control imperix power modules from a Speedgoat simulator. Imperix ±800V isolated voltage sensors are Plug&Play solutions for voltage sensing in power electronics applications. The devices are compatible with 35mm DIN rails and is self-powered by the BoomBox control platform. Imperix ±50A isolated current sensors are Plug&Play solutions for current sensing in power electronics applications. The modules are based on a LEM LAH50-P current sensor and can be self-powered by the BoomBox. For the cases where the RJ45 connectors cannot be implemented, a simple adapter can be used to interface any sensors to the BoomBox. This adapter can be directly ordered at imperix, or downloaded free of charge here. Used as isolated gate-drive interfaces, these fiberoptic cables can be used to connect the BoomBox control platform to your gate drivers. The standard length is 2m. These cables are ideal to connect the analog outputs of the Boombox to any external monitoring device such as an oscilloscope. The standard length is 1m. RJ45 cables feature well shielded twisted pairs of conductors, which is ideal for the transfer of analog signals from sensors to the BoomBox. Standard length is 2m.